Reading and writing are important at our house. We all love to read! We love to write and express ourselves as well. These sites have helps for all things Grammar, Spelling, Writing, and anything you may need for Language Arts in General. 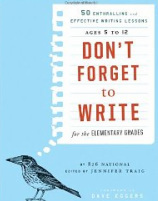 A very fun creative writing book with lessons written by children's books authors! It cracked me up just reading the sample pages! Shurley English looks like a great grammar program. Included in each grade level are weekly lessons in grammar, vocab, language skills and a summary. There are jingles included in each lesson! I think that could be very useful! I've used this program for my kids in the past and they really enjoy it. They like the games and the songs. It's pretty easy to follow, too. I think I"ll be updating what I've got! Teach Your Child to Read in 100 Easy Lessons may sound like a mouthful, but I've used this book as a beginning reading tool and my kids really like it! I've taught 3 of my children to read using this method! I had no idea that Saxon has a phonics program! It looks very comprehensive and something that would be perfect for my younger kiddos. A great site with very extensive and useful reading lists for each grade level/age group. This site also has a free curriculum that is loosely based around the Charlotte Mason Method. A lot of good info found here.